The Arctic region is warming faster than most regions of the world due in part to increasing greenhouse gases and positive feedbacks associated with the loss of snow and ice cover. One consequence has been a rapid decline in Arctic sea ice over the past 3 decades—a decline that is projected to continue by state-of-the-art models. Many stakeholders are therefore interested in how global warming may change the timing and extent of sea ice Arctic-wide, and for specific regions. To inform the public and decision makers of anticipated environmental changes, scientists are striving to better understand how sea ice influences ecosystem structure, local weather, and global climate. Here, projected changes in the Bering and Chukchi Seas are examined because sea ice influences the presence of, or accessibility to, a variety of local resources of commercial and cultural value. In this study, 21st century sea ice conditions in the Bering and Chukchi Seas are based on projections by 18 general circulation models (GCMs) prepared for the fourth reporting period by the Intergovernmental Panel on Climate Change (IPCC) in 2007. Sea ice projections are analyzed for each of two IPCC greenhouse gas forcing scenarios: the A1B ‘business as usual’ scenario and the A2 scenario that is somewhat more aggressive in its CO2 emissions during the second half of the century. A large spread of uncertainty among projections by all 18 models was constrained by creating model subsets that excluded GCMs that poorly simulated the 1979–2008 satellite record of ice extent and seasonality. At the end of the 21st century (2090–2099), median sea ice projections among all combinations of model ensemble and forcing scenario were qualitatively similar. June is projected to experience the least amount of sea ice loss among all months. For the Chukchi Sea, projections show extensive ice melt during July and ice-free conditions during August, September, and October by the end of the century, with high agreement among models. High agreement also accompanies projections that the Chukchi Sea will be completely ice covered during February, March, and April at the end of the century. Large uncertainties, however, are associated with the timing and amount of partial ice cover during the intervening periods of melt and freeze. For the Bering Sea, median March ice extent is projected to be about 25 percent less than the 1979–1988 average by mid-century and 60 percent less by the end of the century. The ice-free season in the Bering Sea is projected to increase from its contemporary average of 5.5 months to a median of about 8.5 months by the end of the century. A 3-month longer ice- free season in the Bering Sea is attained by a 1-month advance in melt and a 2-month delay in freeze, meaning the ice edge typically will pass through the Bering Strait in May and January at the end of the century rather than June and November as presently observed. Part of this report is presented in Flash Video Format (FLV); Adobe Flash Player is required to view it. Download the latest version of Adobe Flash Player, free of charge. 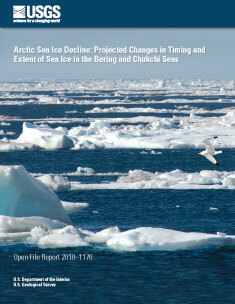 Douglas, D.C., 2010, Arctic sea ice decline: Projected changes in timing and extent of sea ice in the Bering and Chukchi Seas: U.S. Geological Survey Open-File Report 2010-1176, 32 p.